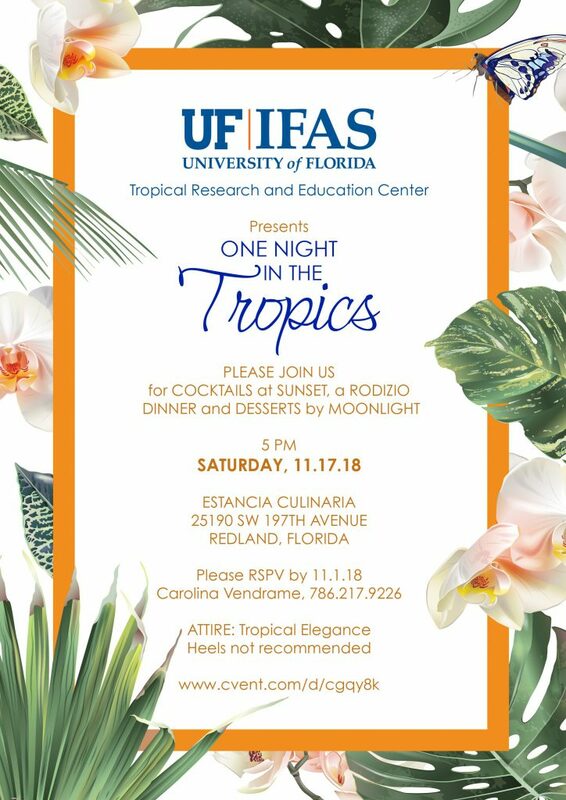 On November 17, The University of Florida, IFAS Tropical Research and Education Center, located in Miami-Dade County in the heart of The Redland, will celebrate its 5th annual fundraising dinner event One Night in the Tropics. You won’t believe how much we have changed; this year’s event will serve as the kick-off for the 90th anniversary since TREC was established in 1929. Tropical Research and Education Center develops solutions through sciences like biotechnology, agroecology, hydrology, entomology, plant breeding and others, collaborating with Florida farmers and tropical climate researchers around the world in the development of agricultural innovations and the conservation of natural resources. This is one night, when our community comes together and makes a difference. Since 2013, UF-IFAS-TREC’s One Night in the Tropics has raised awareness and much needed funding for research, scholarships and established endowments to help our growers thrive. UF-IFAS-TREC’s vital work on the sustainability of tropical and subtropical agriculture and natural resources is directly impacted by the support of our sponsors and donors. One Night in the Tropics will be celebrated at Estancia Culinaria, which is sponsoring the event with the venue. The cocktail is to start at 5PM so that you can enjoy the beautiful sunset and dinner will follow with Rodizio. Tickets are $150 if you buy them before October 12, after October 12 the cost is $175. Also, if you wish to join us only for dessert by moonlight and check our Silent Auction, starting at 8PM, tickets are $35 in advance and $45 at the door. You can get your tickets and become a sponsor, by following the link: TICKETS AND SPONSORSHIP OPTIONS.